Auspicious symbolisms and connotations are inescapable when it comes to Chinese New Year delicacies. Fish, dried seamoss, dried oysters, prawns, chicken, fruits and lettuce amongst others are highly-sought after as they denote prosperity, luck, fortune, abundance, longevity and happiness. It is that time of the year when Chinese chefs compete to conjure up the most exquisite dishes, complete with auspicious names for their delectable creations. After sampling selected dishes from the three Symbolic Set Menus created by executive chef Phuah Chooi Soon and Chinese chef Chew Chee Keong for Si Chuan Dou Hua, Grand Plaza Parkroyal Hotel, we are confident the Year of the Dog will be filled with much laughter, family togetherness, rising prosperity and great abundance. 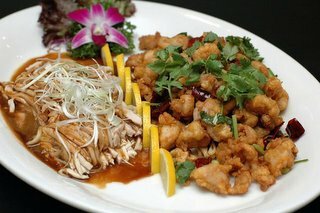 Located on the Lower Lobby, this cheerful Sichuanese restaurant is a complete departure from your typical Chinese outlet. Its sleek yet elegant interior is outfitted with contemporary Chinese furnishings in primarily burgundy and blue hues. Even if the ambience doesn’t grab you, the resident tea-pouring expert is guaranteed to be a conversation-stopper. Nobody can remain unimpressed by his skillful handling of a hand-held copper kettle with a metre-long spout that can pour a shooting stream of hot water from a distance of about two feet away right into your teacup! His pouring aim is so accurate there’s usually very little spillage. 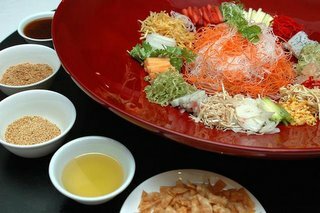 All of us frevently wish for a fruitful year ahead as we lou hei or stirred up the large, colourful platter of Tropical Fruit Yee Sang (raw fish salad). Light and refreshing, the combination of sliced strawberry, dragon fruit, honey dew, kiwifruit, water apple, rock melon, pear and mango lent a healthy twist to this perennial Chinese New Year delight. Other ingredients that added colours and flavours to the combo included dried yam strips, red and green pickled ginger, pickled pearl onions, finely shredded carrot and radish, pomelo sacs, flour crisps, sesame seeds, ground peanut, five-spice and pepper powder, fragrant oil and a fruity sour plum sauce. Also available are Abalone, Salmon, Soft Shell Crab, Yellow Fin Tuna, Jellyfish and Pacific Clam Yee Sang (prices range from RM38++ to RM188++ depending on portion size). We discovered distinctly different spicy nuances in the Double Combination Chicken platter. The Sichuan Pang Pang Chicken comprise shredded chicken, wakame (Japanese seaweed), flaxseed, shredded carrot and gobo (Japanese burdock) dressed in a mildly spiced, peppery sauce. The second creation of Wok-fried Spicy Boneless Chicken with Chinese Parsley was memorable for the crispy chicken dices’ robust spiciness. 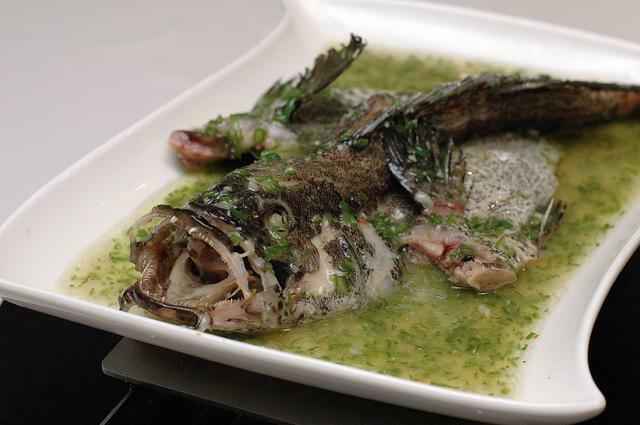 Another impressive dish that had us waxing lyrical over it was the Steamed Garoupa with Green Chilli-Garlic Sauce from the Fortune Set Dinner. The accompanying sauce concocted from superior stock, finely chopped green chilli and minced garlic perked up our palate with its understated spiciness, making this splendid dish a welcome change from the usual steamed fish with superior soya sauce that is so prevalent in other Chinese restaurants. While the braised dried oyster, fatt choi (black seamoss), broccoli florets and shirataki (little bundles of chewy konnyaku strands, RM28++) was impeccably prepared, it was the Homemade Green Tea Tofu with Scallops, Angled Loofah and Pumpkin Purée (RM48++) that had us polishing the dish off within minutes. 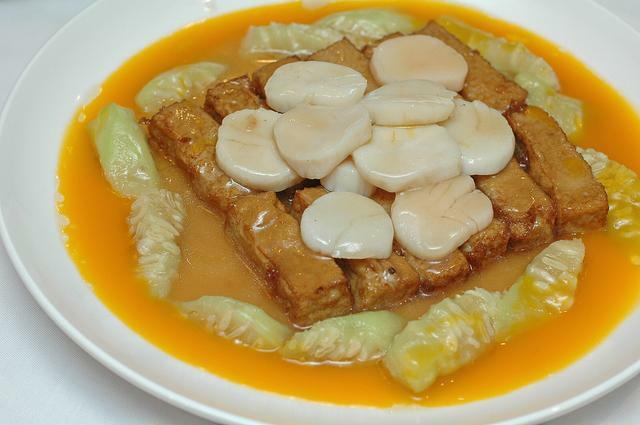 The soft, silky beancurd gently imbued with hints of green tea was aptly complemented by the delicate sweetness of fresh scallops, angled loofah and pumpkin purée. 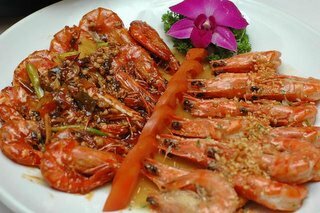 Prawns or har in Cantonese are extremely popular for the word signifies happy laughter. Chef Phuah’s Sichuanese and Cantonese-style Tiger Prawns will have you smiling from ear to ear – the Sichuanese portion incorporated stir-frying the crustaceans with tau parn cheong (chilli bean sauce) and the Cantonese-style preparation rendered the prawns in superior stock laced with chopped green chilli and fragrant Hua Tiao wine. Fried rice with top shell clams and spring onions together with tong yuin (glutinous rice ball filled with sesame paste in ginger syrup) rounded off our feast, leaving us replete but not stuffed to the gills. The Symbolic Set Menus for Chinese New Year are available at RM638++, RM738++ and RM838++ per table of 10 persons from now until February 12, 2006. To foster good rapport and close bonding with family and friends, be sure to savour the gastronomic speciality of Pun Choy or Big Bowl Feast (RM488++ and RM688++), an oversized bowl filled with premium ingredients — abalone, scallops, dried oysters, roast duck, garoupa fillet and vegetables. Notify the restaurant at least a day in advance for its preparation. 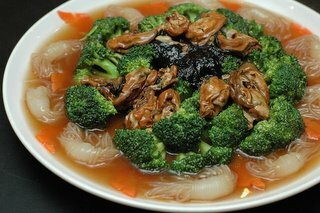 The restaurant will be opened throughout the Chinese New Year period. Gong Xi Fa Cai! This recipe is pretty easy to pull off - you only need a bit of patience and time. The ingredients are simple enough and can be adjusted accordingly to the quantity that you plan to cook. For a family of four, I usually opt for a 1.5-2kg free-range chicken. Boil a whole pot of water - use a tall, deep pot that will let you immerse the whole chicken into it. Once the water has boiled, turn off the heat and immerse the chicken into the pot of water. Ensure the water submerged the chicken completely. Let it poach in the 'water bath' with the pot covered - this usually takes about 1.5 to 2.5 hours, depending on the bird size. If the water has cooled down, it is ok to reheat the water but resist from letting it boil. Some recipes call for the addition of a knob of smashed ginger or a slice or two of 'dong gwai', a type of Chinese herb. Use what suits you best. When the chicken is cooked, test its doneness by inserting a chopstick into the thigh area (where the meat is thickest). If the juices run clear then the chicken is most cooked. Otherwise I usually slice off both the drumsticks first and return the chicken into the water bath so that any raw parts will be cooked thoroughly. The water that was used for cooking the chicken can be kept aside to be used as chicken broth to flavour and prepare chicken rice. Chop up the chicken into desired portions once it has cooled down. Alternatively, some cooks prefer to run the chicken over cold or ice water before chopping it up. To serve, drizzle some sesame oil and soya sauce over the chicken. Peel and smashed old ginger. Wash and clean rice, draining off water. Saute smashed ginger and minced garlic with Planta margarine and sesame oil until aromatic. Add in washed rice and stir-fry over high heat until rice turns translucent. Scoop into rice cooker and pour in chicken broth - the amount required will be similar to the usual amount of liquid for cooking plain rice. Stir everything evenly and add in pandanus leaves. Let the rice to cook automatically in the electric rice cooker. My family simply adores this simple, hearty dish. I hope you would too. Too bad I have no photos to upload - I will cook this again pretty soon so I'd be sure to capture some shots then.